April 5, 2019, Department, by Rafael Payan, Ph.D. The Pew Research Center projects that in 2045, the United States will become a majority-minority nation. When this happens, all Americans will statistically become minorities, as no ethnic or racial group will compose 50 percent or more of the nation’s overall population. The Brookings Institution (Brookings) forecasts that during that year, whites will comprise 49.7 percent of our nation’s population in contrast to 24.6 percent for Latinos, 13.1 for blacks, 7.9 percent for Asians and 3.8 percent for multiracial Americans. California, Hawaii, New Mexico and Texas have already reached majority-minority status. Other states will soon follow this trend. The demographic shift is especially reflected in our nation’s youth. According to Brookings, because minorities tend to be younger than whites, the tipping point where minorities become a majority has already arrived for younger Americans. The United States Census Bureau reports that on July 1, 2015, the number of the nation’s racial or ethnic minority babies reached 50.2 percent, becoming the first group of Americans to reach majority-minority status. The Bureau adds that the 2014–2015 school year marked the first time minority student enrollment in public schools surpassed that of white students. These young Americans are our industries’ patrons, and some will become our future employees and leaders. The rapid demographic shift is attributed to several factors, including the simultaneous decline in the birth rate and an increase in the death rate among whites. This trend sharply contrasts with higher birth rates among Americans of African, Asian, Latino, Native-American and multiracial descent. Legal and illegal immigration also influences our nation’s demographic fabric. 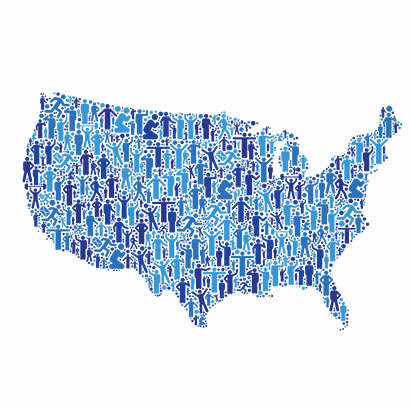 In the past, numerically large, diverse populations were typically found in our coastal and industrial metropolitan communities. Now, small towns across rural America are also experiencing a significant demographic shift. There has been quite a bit of research, discourse and implementation of programs that focus on the “graying of America.” However, we must also consider the other end of the age spectrum. How the “browning of America” will affect our organizations is and will continue to be, in great part, dependent on how we prepare and respond. For some, this societal change may cause discomfort; for others, it creates a welcomed opportunity to enhance our relevance to extant and future generations. Although some communities may be somewhat buffered, demographic change will affect all Americans in varying degrees. Like our educational, medical and research institutions, our industry has the potential to influence our nation’s socioeconomic, environmental, physical and mental health. We must be inclusive and establish policies and practices that enhance all Americans’ well-being. To not do so may compromise our nation’s future. Our reach must include populations that have been or may be overlooked. Our industry has successfully challenged and overcome social and physical barriers through its alignment with laws that abolished “separate but equal” practices and through the implementation of inclusionary legislation, including Title IX and the Americans with Disabilities Act. We must continue to remove barriers that intentionally or unintentionally limit services. This includes rethinking and adapting our parks and programs to ensure they are relevant to our changing customer base. Thankfully, many of our nation’s premier parks, recreation and resource conservation agencies have a robust tradition of offering high-quality opportunities to their broad-based constituencies. They recognize that the integrated investment of time, personnel and financial resources — especially focused on youth — can yield high-quality results. Someone took the time when we were younger to teach each of us how to toss a ball, camp or love nature, thereby influencing how we live, work and play today. If we do not teach our nation’s youth, particularly its increasingly demographically diverse child population, how to cherish this land and how to participate in healthful activities, we should not be surprised if they do not vote to fund park, recreation and natural resource protection initiatives when they become part of the electorate. Along California’s Central Coast, the Monterey Peninsula Regional Park District (District) is embarking on an initiative that provides the region’s schoolchildren with access to nature and science-based opportunities. This annualized transportation and entry-fee grant program, financed through the department’s general fund, will help the region’s school districts and not-for-profit organizations underwrite transportation and user fees. Rather than limiting participation solely to District properties, grant funds will make access to other jurisdictions’ beaches, aquariums, youth-based science camps and parks possible. The goal is to enhance environmental literacy and outdoor activity for every school-aged child residing in the region, irrespective of physical ability or socioeconomic status. This grant program will touch the lives of children living in some of this nation’s wealthiest, as well as some of its most impoverished, communities. California’s Central Coast is one of the world’s most productive agricultural regions. Thus, its local communities include a substantial resident and migrant farm-worker population. Although some farm workers live within 10 miles of Monterey Bay and redwood-forested canyons, many of their children have never been to a nearby beach, seen a breaching humpback whale or stood beneath some of the world’s tallest trees. This grant program will strive to reverse this situation. Every child’s experiential growth makes us a better, stronger and smarter nation. The state of California is introducing a companion initiative: Assembly Bill 556, known as the “Outdoor Experiences: Community Access Program: Grant Program.” Designed especially for youth in low-income and disadvantaged communities, this initiative will develop and implement a community access program focused on engagement programs, technical assistance or facilities that maximize safe and equitable physical admittance to natural or cultural resources, community education programs or recreational amenities. It authorizes development of a grant program for transportation projects to provide diverse, disadvantaged and low-income youth access to outdoor experiences. Our nation and the parks, recreation and resource conservation industries have a history of successfully adapting to planned and unexpected change. Because there is no indication that the trends guiding our nation’s demographics shift will reverse anytime soon, we can expect that adaptation will be key to our respective industries’ success. Few industries can influence our nation’s and world’s future. Ours can. Ours must. Rafael Payan, Ph.D., is the General Manager for the Monterey Peninsula Regional Park District.